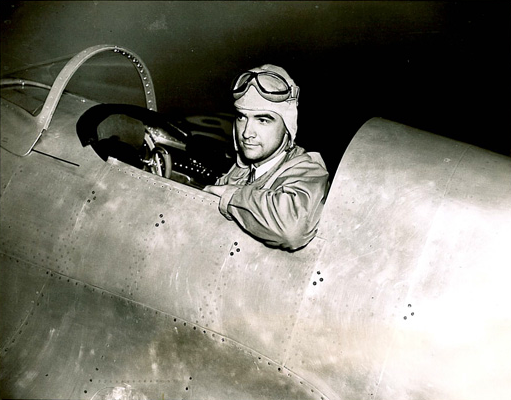 19 January 1937: Howard Robard Hughes, Jr., departed Union Air Terminal, Burbank, California, at 2:14 a.m., Pacific Standard Time (10:14 UTC) aboard his Hughes Aircraft Company H-1 Racer, NR258Y. He flew non-stop across the North American continent to Newark Metropolitan Airport, Newark, New Jersey, and arrived overhead at 12:42:25 p.m., Eastern Standard Time (17:42:25 UTC). 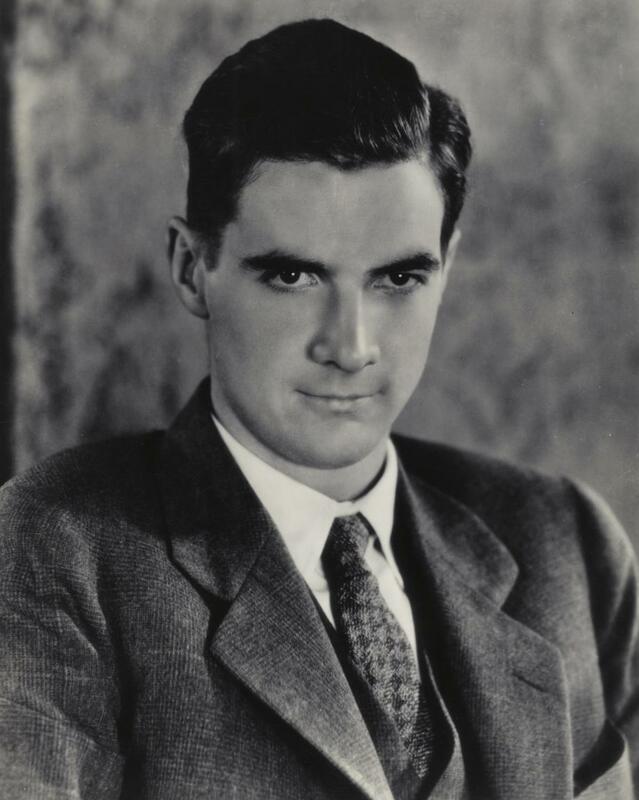 All landplane distance speed records were broken yesterday by Howard Hughes, millionaire sportsman pilot, who reached Newark Airport 7 hours 28 minutes and 25 seconds after he took off from Los Angeles, Calif. He was forced to stay aloft until the runway at the field was clear and landed at 1:03 P.M. His average speed was 332 miles an hour for the 2,490 miles he traveled. Grimy from the smoke of his exhaust stacks the lanky pilot climbed out of his cramped cockpit and grinned. In recounting his experiences on the flight he said that the skies were overcast all the way and he had to fly on top of the clouds . . . It was 2:14 o’clock in the morning and pitch dark when he opened the throttle at the Union Air Terminal at Burbank and released the 1,100 horsepower sealed in the fourteen cylinders of his supercharged Twin Row Wasp engine. 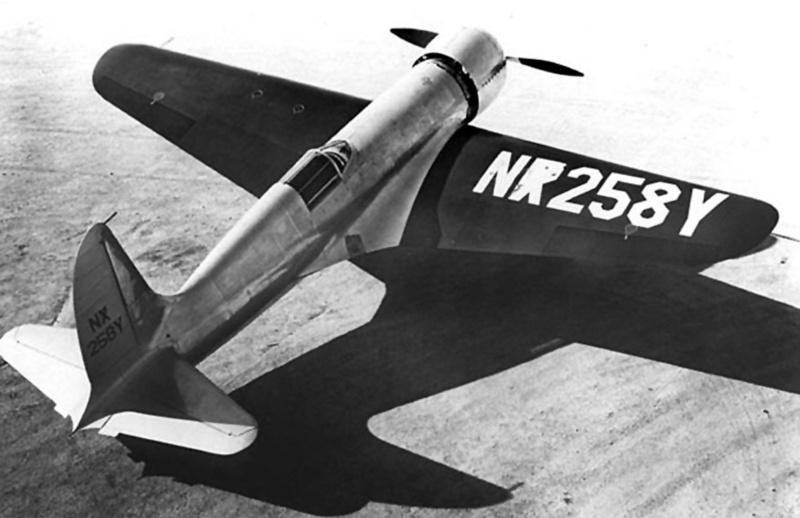 The sleek gray and ble low-winged monoplane, designed and built under his own direction, staggered, accelerated and then literally vaulted into the air. Within a few seconds Hughes climbed into the low-hanging clouds and swung eastward . . .
At 14,000 feet, at which altitude he flew most of the way, he passed over the clouds, set his course and leveled off. He throttled his engine back until it was delivering only 375 horsepower and hunched himself over his instrument panel . . .
His arrival at Newark was unheralded and a surprise. It was thought that he was going to land at Chicago. The new United Air Lines extra-fare plane was loaded for its initial run and already had its door locked when the propeller whir of the hurling racer apparently made the buildings tremble from sound vibration as Hughes swept low across the field. William Zint of the Longines Watch Company, official timer for the National Aeronautic Association, noted the time. It was exactly 42 minutes and 25 seconds after noon. Hughes pulled up in a sweeping chandelle maneuver and circled. The United Air Liner was already on the runway when Hughes swung back toward the flaps on his wing to slacken speed for landing . . . and the plane settled fast toward the earth. Still the pilot had no signal from the control tower where the dispatchers act as traffic patrols at the busiest airport in the world. Hughes had to open his throttle again and cruise around the field for some time before the green light at last came on. The United plane was then well on its course toward Chicago. 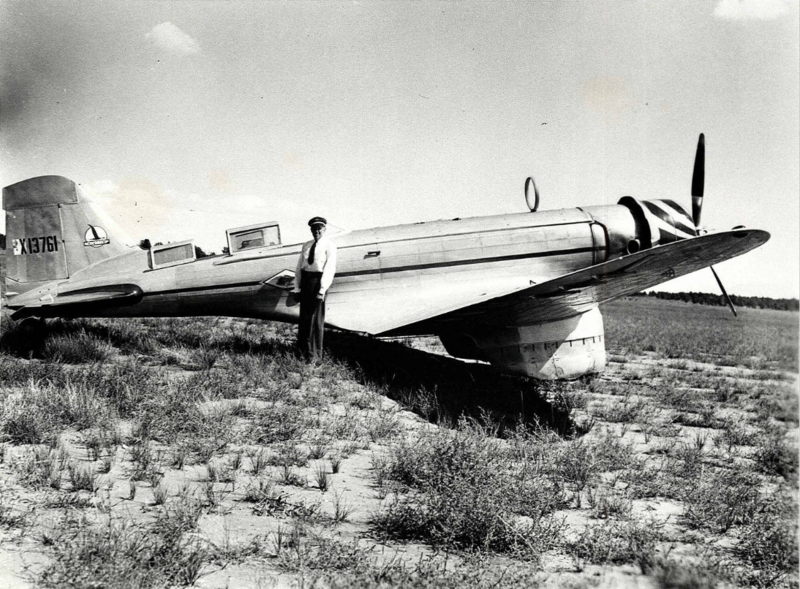 Hughes’s plane slid in over the airport boundary, dropped it’s retractable undercarriage and tail wheel and touched both wheels and tail wheel in a perfect three-point landing at 1:02:30 P.M. . . .
— Excerpted from an article in The New York Times, Wednesday, 20 January 1937, Page 1 at Columns 6 and 7. 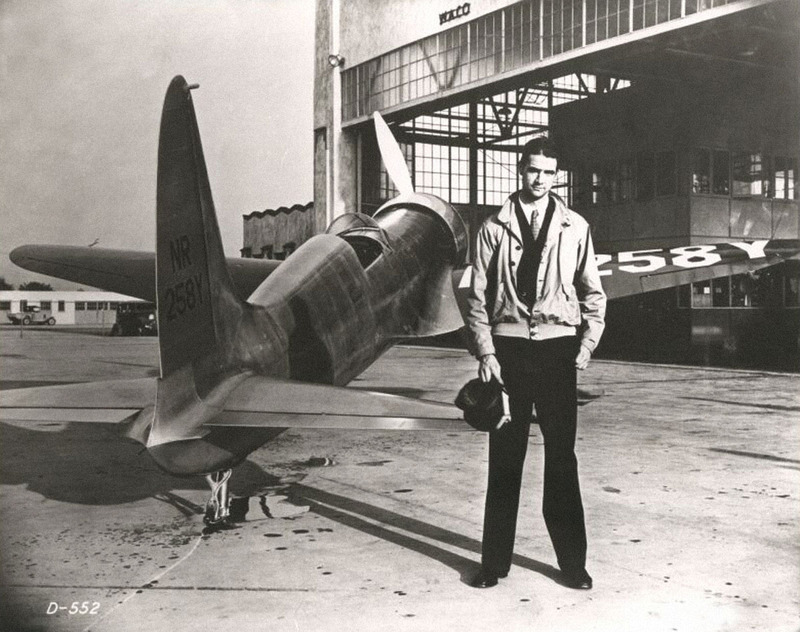 Howard Hughes with his H-1 Racer, NR258Y. The Hughes H-1 (FAA records describe the airplane as a Hughes Model 1B, serial number 1) was a single-seat, single-engine low wing monoplane with retractable landing gear, designed by Richard W. Palmer. Emphasis had been placed on an aerodynamically clean design and featured flush riveting on the aluminum skin of the fuselage. The airplane is 27 feet, 0 inches long (8.230 meters) with a wingspan of 31 feet, 9 inches (9.677 meters) and height of 8 feet (2.438 meters). (A second set of wings with a span of 25 feet (7.6 meters) was used on Hughes’ World Speed Record ² flight, 13 September 1935.) The H-1 has an empty weight of 3,565 pounds (1,617 kilograms) and gross weight of 5,492 pounds (2,491 kilograms). The H-1 was powered by an air-cooled, supercharged, 1,534.943-cubic-inch-displacement (25.153 liter) Pratt & Whitney Twin Wasp Jr., a two-row, fourteen-cylinder radial engine. 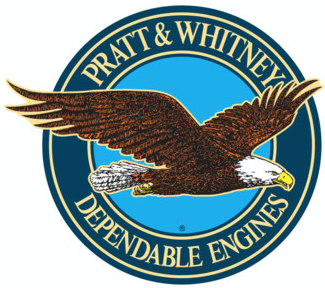 Pratt & Whitney produced 18 civil and 22 military versions of the Twin Wasp Jr., in both direct drive and geared configurations, rated from 650 to 950 horsepower. It is not known which version powered the H-1, but various sources report that it was rated from 700 to 1,000 horsepower. The engine drove a two-bladed Hamilton Standard controllable-pitch propeller. 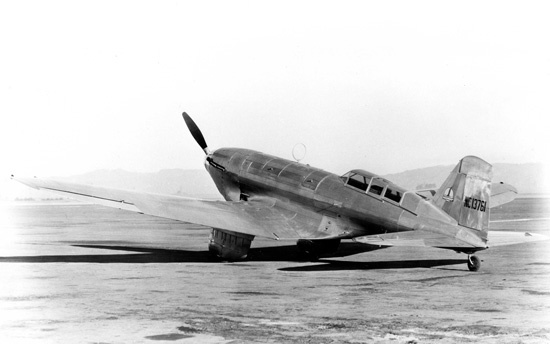 14 January 1936: Flying a Northrop Gamma 2G, serial number 11, which he had leased from Jackie Cochran, Howard Robard Hughes, Jr., set a Fédération Aéronautique Internationale (FAI) World Record for Speed Over a Recognized Course (Los Angeles, California, to New York) in 9 hours, 26 minutes, 10 seconds, at an average speed of 417.0 kilometers per hour (259.1 miles per hour).¹ Most of the flight was made at altitudes of 15,000–18,000 feet (4,572–5,486 meters), and Hughes used supplemental breathing oxygen. Jack Northrop had designed and built the Gamma as a long-range cargo and mail plane for Transcontinental and Western Air, Inc. The contract was cancelled, though, and several airplanes became available to other customers. 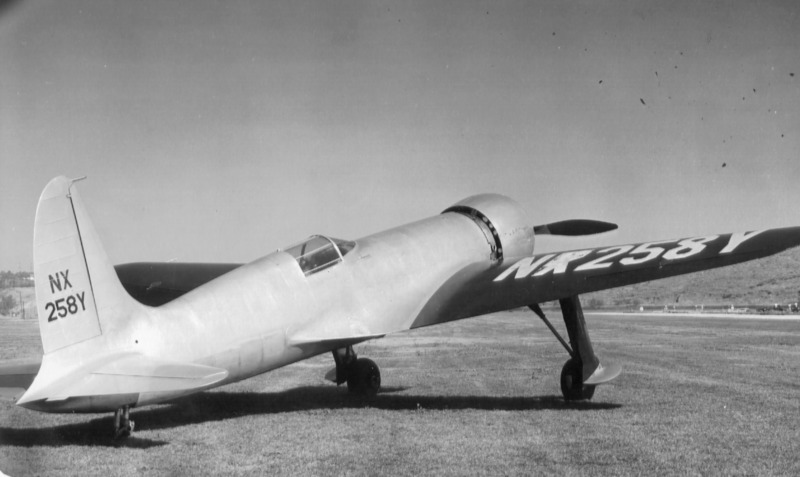 Jackie Cochran purchased s/n 11, which had been completed 15 August 1934, and had it modified by Northrop as a two-place long-distance racer for the 1934 MacRobertson London-to-Australia air race, which she planned to fly with her friend Ted Marshall. 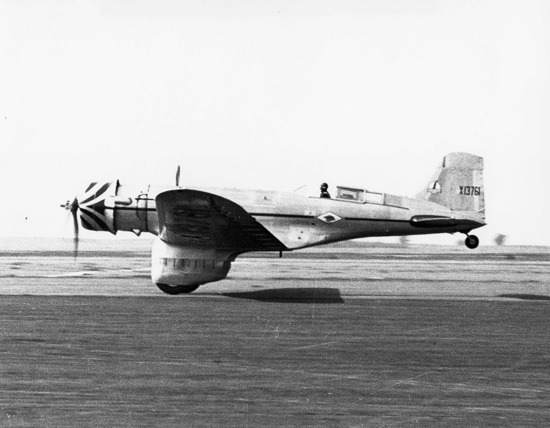 The length of the Gamma varied from 29’10” to 31’0″, depending on engine and cockpit configuration. The wingspan was 48’0″. The Gamma’s original engine was replaced with a liquid-cooled, supercharged, 1,570.381-cubic-inch-displacement (25.734 liters) Wright Aeronautical Division Conqueror SGV1570F4 (also known as the Curtiss Conqueror), a DOHC 60° V-12 engine rated at 745 horsepower at Sea Level. The engine drove a two-bladed propeller. The Gamma had 7 fuel tanks: 3 in each wing and 1 in the fuselage. Total capacity was 486 gallons (1,840 liters) of gasoline and 29 gallons (110 liters)of lubricating oil. 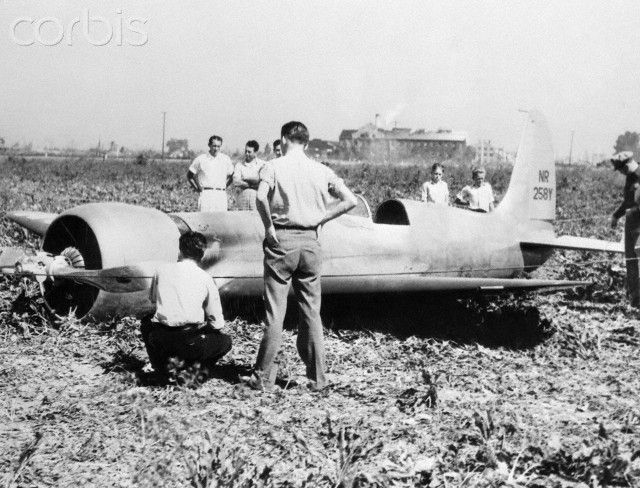 A second fuselage tank was later added, bring the total fuel capacity to 586 gallons (2,218 liters). The Gamma 2G had an empty weight of 4,727 pounds (2,144 kilograms) and a maximum gross weight of 8,037 pounds (3,646 kilograms). The modified airplane was inspected and a temporary commercial registration, NC13671, was approved 29 September 1934. While being ferried to New York by Jackie and her new copilot, Royal Leonard, problems with the engine’s supercharger forced them to land in Arizona. Cochran continued east by airliner while Leonard and a Curtiss-Wright mechanic continued east in the Gamma. Flying on the night of 1 October 1934, a continuing problem with the supercharger forced them to make an off-field landing near Tucumcari, New Mexico, using light from dropped flares. The Gamma was seriously damaged and had to be returned to Northrop for repair. The airplane’s temporary registration was suspended. A section of the wing and the forward lower half of the fuselage were replaced, provisions for installing a Pratt & Whitney radial engine were made, and the rear cockpit was removed. 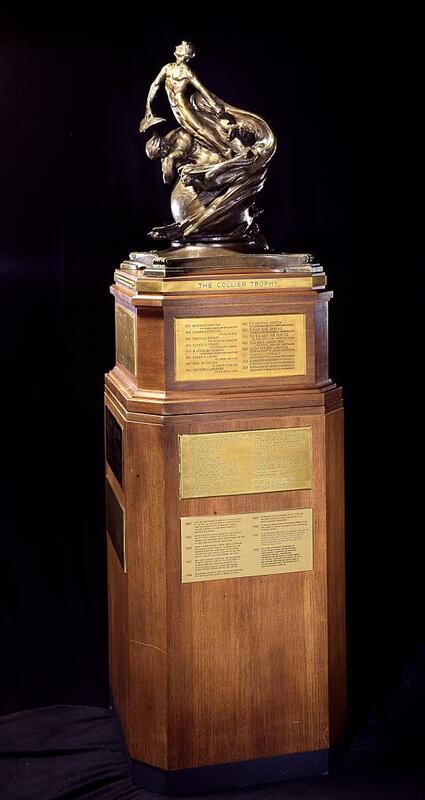 (Cochran’s plans for the MacRobertson Race had to be revised,² so she had the airplane modified for the Bendix Trophy Race.) The repairs and modifications were completed 30 November 1934. The “re-modified” Gamma 2G was now powered by an air-cooled, supercharged, 1,534.943-cubic-inch-displacement (25.153 liters) Pratt & Whitney Twin Wasp Jr. SA1-G 14-cylinder radial engine with a three-bladed Hamilton Standard controllable-pitch propeller. The SA1-G was rated at 700 horsepower at 2,500 r.p.m. at 6,500 feet (1,981 meters). The engine could be ordered with a 3:2 or 4:3 gear reduction ratio. 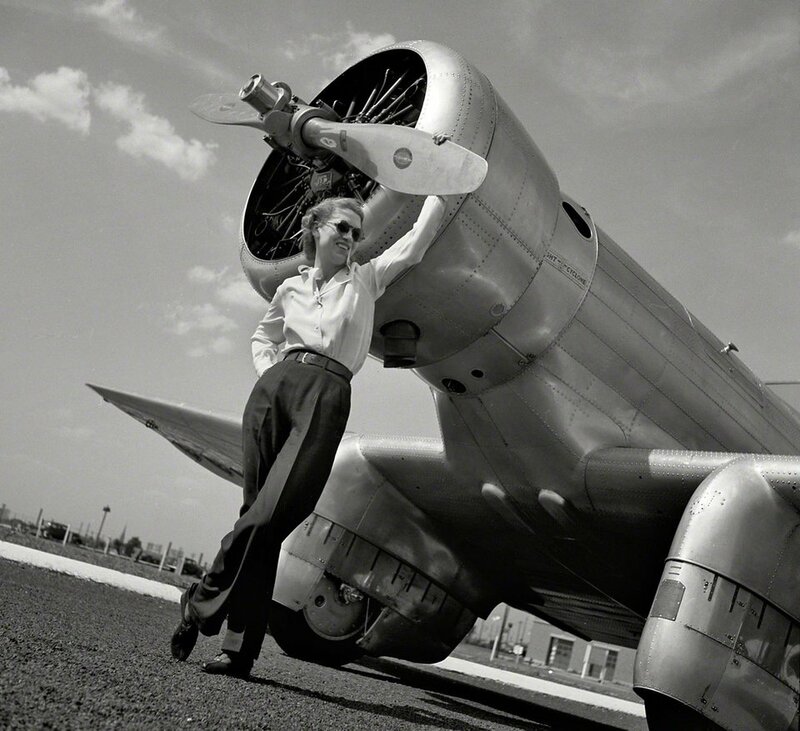 Jackie Cochran flew the Gamma in the 1935 Bendix Trophy Race, but, approaching severe weather over the Grand Canyon, landed the airplane and did not finish the race. Finally, a Bill of Sale from The Northrop Corporation, dated 30 November 1935, was provided to the Aeronautics Bureau. 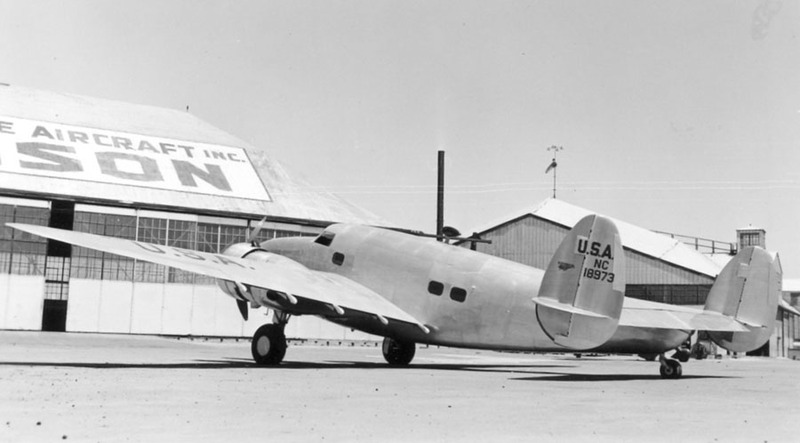 It said that Northrop had sold the airplane to Cochran, “for and in consideration of ten dollars ($10.00)”. One night about 11:30 I was exhausted in my hotel room and the telephone rang. . .
“Howard who?” I say, still sleepy and getting frustrated. “Howard Hughes,” the man says. “Howard who?” I ask again. “So do I,” I say. 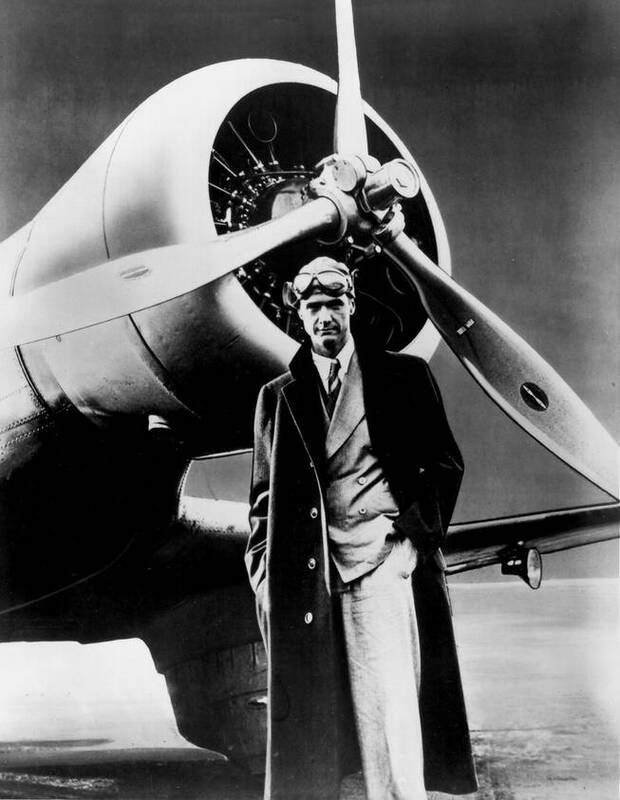 Howard Hughes and I negotiated over the Northrop Gamma for about four weeks. . . Howard wanted my Northrop so badly, but it would break my heart to consider handing over my rights to it. . . when he offered to rent it, with an option to buy, I caved in. . . .
— Jackie Cochran: An Autobiography, by Jacqueline Cochran and Maryann Bucknum Brinley, Bantam Books, New York, 1987, at 152–153. 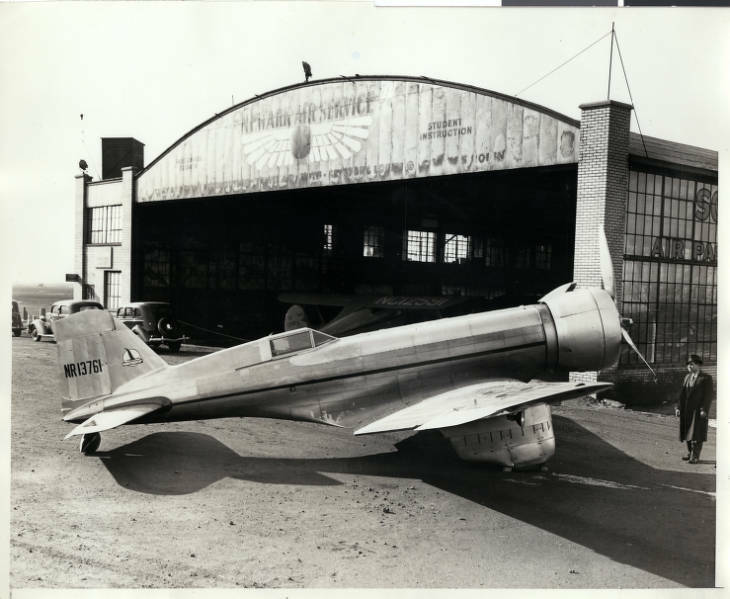 When Hughes took possession of the Gamma 2G, he had the Pratt & Whitney engine replaced with a 1,823.129 cubic-inch (29.785 liter) Wright Cyclone SGR-1820-G5 nine-cylinder radial engine, and a three bladed-Hamilton Standard constant-speed propeller with a diameter of 11 feet, 3 inches (3.429 meters). 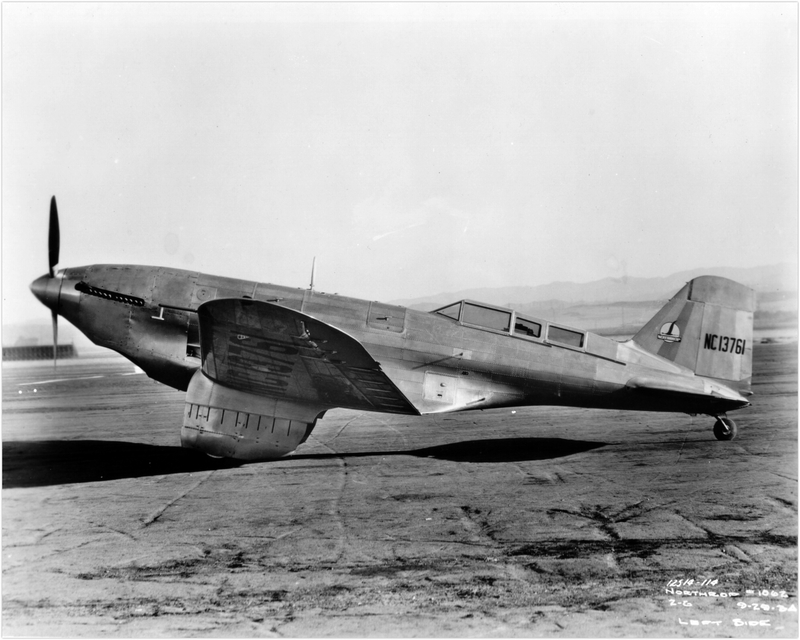 The engine used a bell-shaped cowling similar to that of Hughes’ H-1 Racer. The engine had a Normal Power rating of 830 horsepower at 2,100 r.p.m to 4,300 feet (1,311 meters), and 930 horsepower for Takeoff. 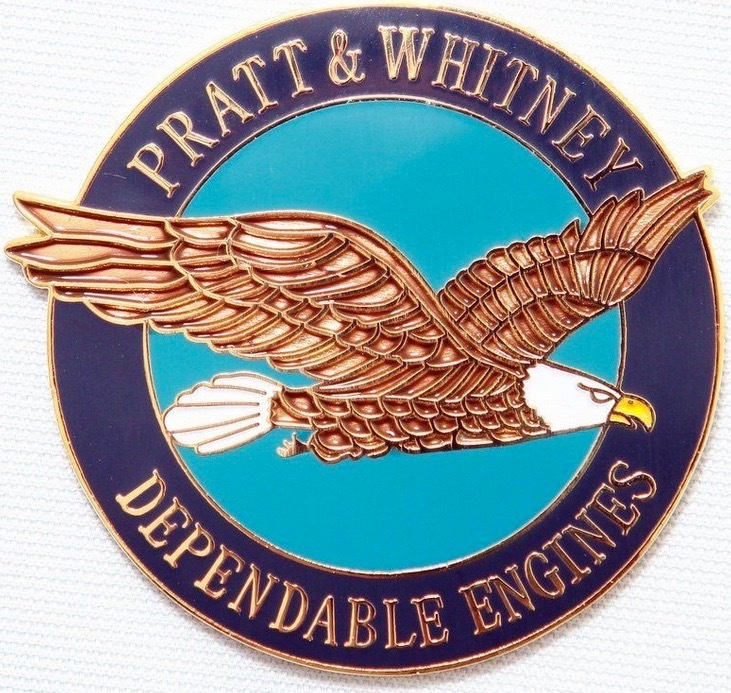 This engine did not yet have government certification. Three additional fuselage tanks were installed, increasing the Gamma’s fuel capacity to 690 gallons. Hughes did not submit the Gamma for Department of Commerce inspection and licensing. It was not approved in the new configuration. 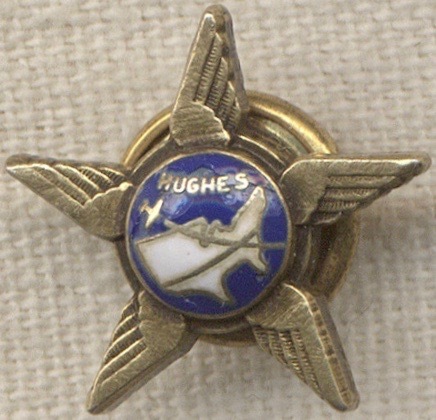 Jackie Cochran took the Gamma back from Hughes and had the Twin Wasp Jr. reinstalled, and submitted a new application for registration 31 March 1936. This was approved 28 April 1936, and the Gamma received a restricted registration, NR13761. It was damaged beyond repair after an emergency landing, 10 July 1936. ² With Northrop unable to repair the airplane in time for the MacRobertson Race, at the last minute Jackie Cochran entered with a different airplane (a Granville Brothers Gee Bee R-6H). 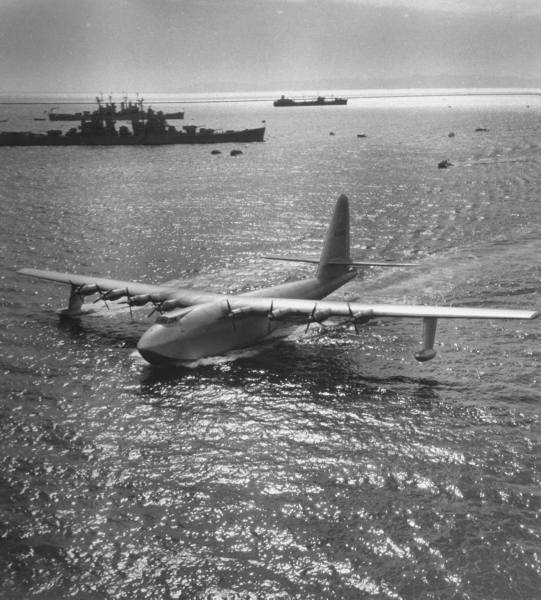 2 November 1947: Howard Hughes’ Hughes Aircraft Company H-4 Hercules flying boat, NX37602, made its first and only flight at the harbor of Los Angeles, California. 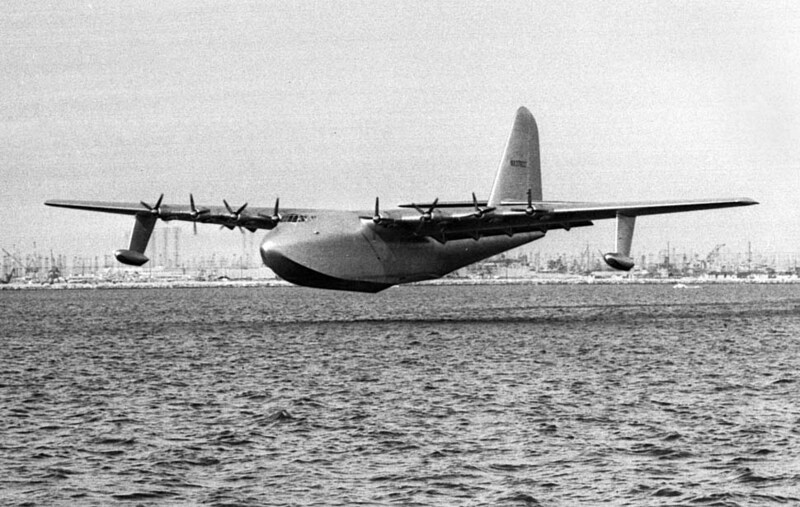 The new media called it “The Spruce Goose” due to its strong but lightweight wooden construction. As with the famous de Havilland DH.98 Mosquito fighter-bomber, the use of wood freed up valuable metal alloys during World War II. 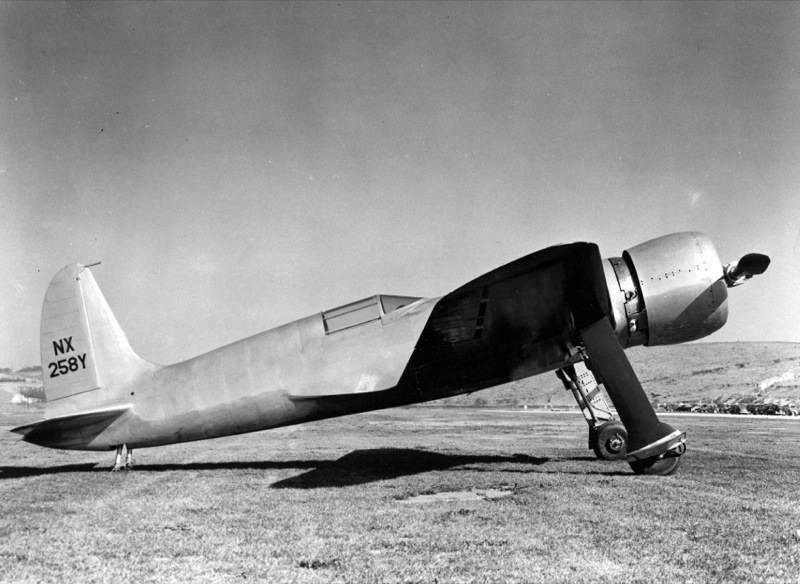 Conceived by Henry J. Kaiser, the airplane was initially called the HK-1. It was designed to carry as many as 750 fully-equipped soldiers on transoceanic flights. The H-4 is 218 feet, 8 inches (66.650 meters) long with a wingspan of 320 feet, 11 inches (97.815 meters). Its height is 79 feet, 4 inches (24.181 meters). The Hercules’ designed loaded weight is 400,000 pounds (181,437 kilograms). The flying boat was powered by eight air-cooled, supercharged 4,362.49-cubic-inch-displacement (71.489 liter) Pratt & Whitney Wasp Major VSB11-G (R-4360-4A) four-row 28-cylinder radial engines with a compression ratio of 7:1. 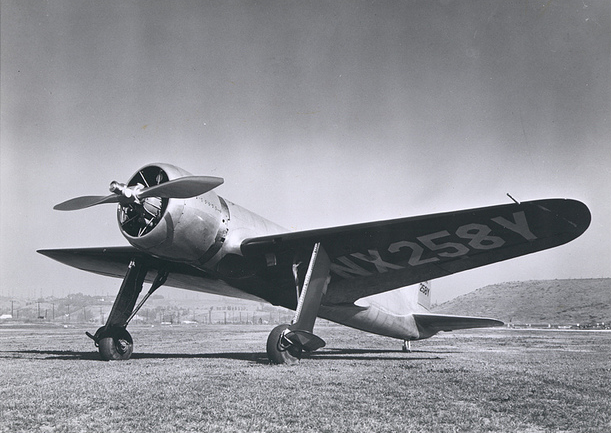 The R-4360-4A had a Normal Power rating of 2,500 horsepower at 2,550 r.p.m. to 5,000 feet (1,524 meters), 2,200 horsepower at 2,550 r.p.m. to 14,500 feet (4,420 meters), and a Takeoff rating of 3,000 horsepower at 2,700 r.p.m. The Military Power rating was also 3,000 horsepower at 2,700 r.p.m., to an altitude of 1,500 feet (457 meters), then decreased to 2,400 horsepower at 2,700 r.p.m. to 13,500 feet (4,115 meters). The engines turned four-bladed Hamilton Standard propellers with a diameters of 17 feet, 2 inches (5.232 meters) through a 0.425:1 gear reduction. The R-4360-4A was 8 feet, 0.75 inches (2.457 meters) long, 4 feet, 4.50 inches (1.334 meters) in diameter, and weighed 3,390 pounds (1,538 kilograms). On its only flight, the H-4 Hercules traveled approximately one mile (1.6 kilometers) at 135 miles per hour (217 kilometers per hour), remaining in ground effect. It never flew again, and its estimated performance was never verified through flight testing. The airplane is on display at the Evergreen Aviation and Space Museum, McMinnville, Oregon. Just after completing the final pass over the course, the airplane’s engine stopped due to fuel starvation. Hughes made a belly landing in a farm field. He was uninjured and the airplane received only minor damage. 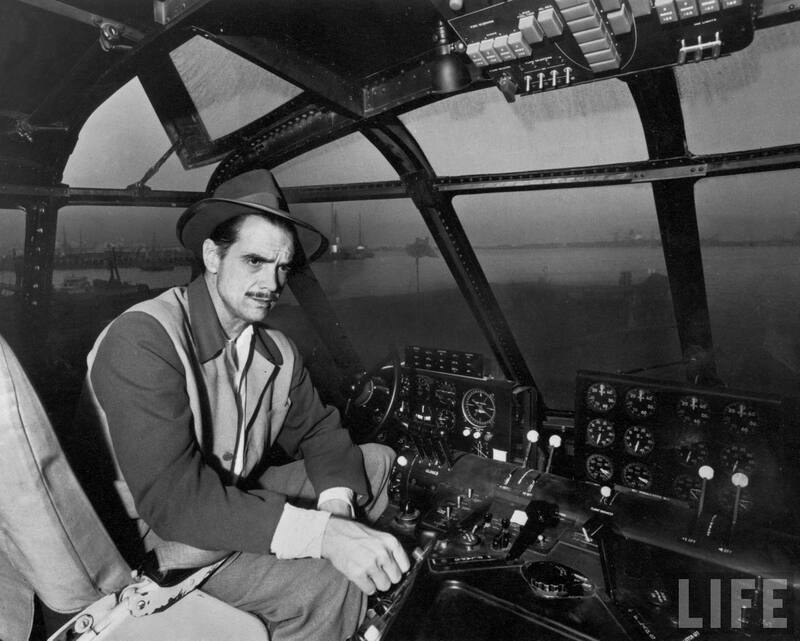 Howard Hughes, Millionaire sport flyer, missed death by a narrow margin yesterday morning a few seconds after he brought back to the United States the world’s speed mark for land planes when he averaged 347 miles an hour near Santa Ana. Official confirmation of the new mark must await calibration of the speed over the measured three-kilometer course, bordering the Eddie Martin Airport, by the Federation Aeronautic Internationale of Paris, France. The figures are to be submitted following a conference between officials of the National Aeronautics Association and representatives of the California Institute of Technology. 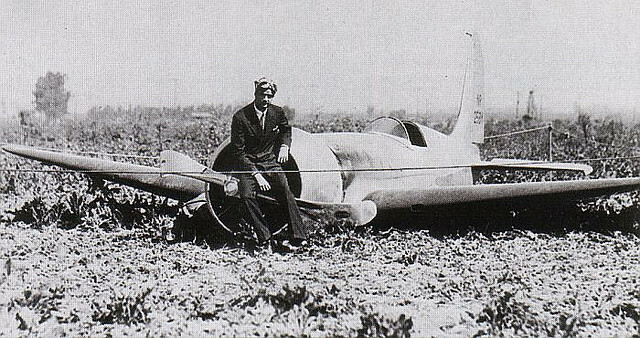 “I don’t expect any difficulty in having Hughes’s speed marks officially allowed,” said William R. Enyart, official timer, shortly after the mystery racing plane made a forced landing in a beet field and ploughed a furrow for sixty yards. Hughes had just completed his seventh lap against the former world record of 314.319 miles an hour, held by Raymond Delmotte of France, when he suddenly lifted the silver monoplane into the air as his fourteen-cylinder Wasp radial air-cooled engine sputtered. The pilot sought altitude, climbing to 500 feet. Then he turned and headed for the beet field, his engine stopped. Despite his landing speed of about eighty miles and hour, Hughes made a perfect “dead stick” landing as the ship flattened out on its lower side and slid through the soft ground. A bent propeller and wrenched landing gear were the only visible damage. 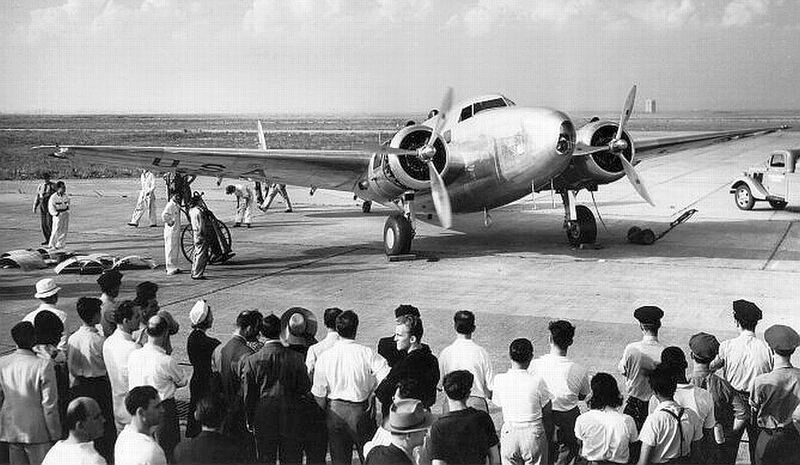 Hughes received the congratulations of numerous officials gathered to witness the assault on the speed record for his manipulation of the speedy ship and the perfect landing. 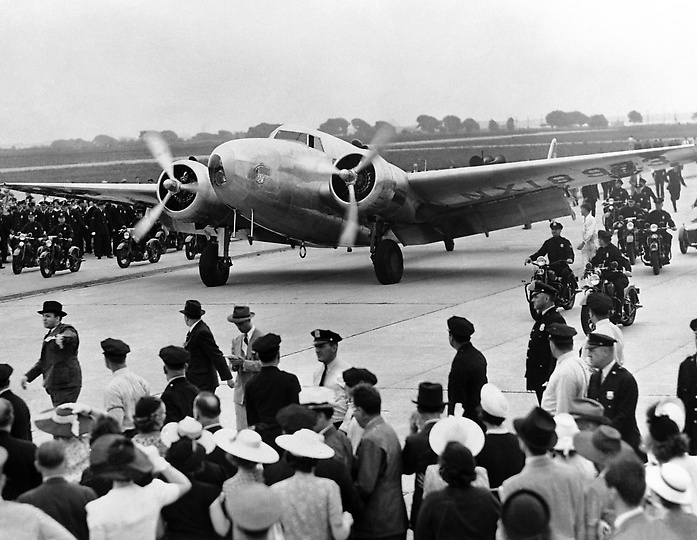 Amelia Earhart, who had been flying as an observer, was one of the first to praise the pilot. Six record-breaking tests were made as Hughes streaked over the course. An electronic chronograph photographed and clocked each flight. Four are required to officially set a new speed mark. Determination of Hughes to make his second record-breaking attempt early yesterday morning came as a surprise and after he and his assistants had spent the night checking over difficulties faced in the flight late Thursday afternoon. Hughes rolled his $120,000, 1000-horsepower, low-winged monoplane from the hangar at Union Air Terminal shortly after daylight and awaited word from officials at the measured course that all was in readiness. At 6:30 a.m. he flashed into the air and an hour and ten minutes later had made his successful seven flight when halted by the gas supply stoppage. Hughes and associates announced that the next speed record he will attempt to break in his specially constructed racer will be the flight from Los Angeles to New York. The present time, 10 hours and 2 minutes, is held by Col. Roscoe Turner. 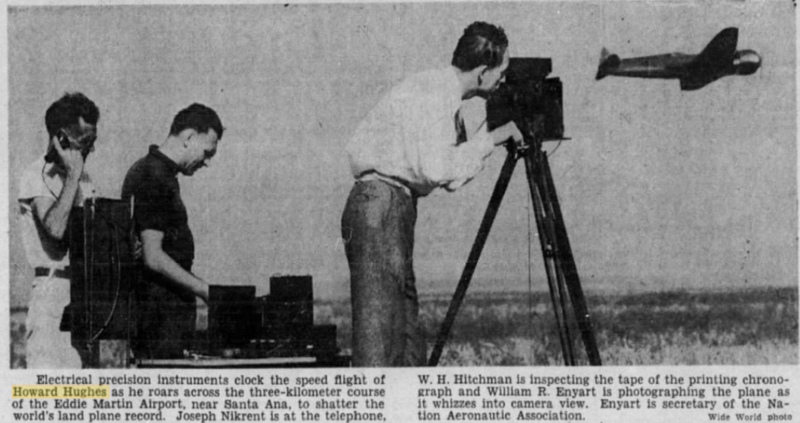 The record-breaking flight was made over the course on the Irvine ranch surveyed for the late Dr. Albert A. Michelson’s experiments to measure the speed of light. Joe Nikrent and W.H. Hitchman, representing the National Aeronautic Association, helped time the dashes. In beating the Delmotte record by approximately twenty-nine miles an hour, Hughes brings back to America, the record once held by the late James Wedell. Wedell set a world mark of490.8 kilometers an hour, only to have it bettered by the French flyer last December 24. The Hughes H-1 (Federal Aviation Administration records identify the airplane as the Hughes Model 1B, serial number 1) was a single-seat, single-engine low-wing monoplane with retractable landing gear. Emphasis had been placed on an aerodynamically clean design and featured flush riveting on the aluminum skin of the fuselage. The airplane was 27 feet, 0 inches long (8.230 meters) with a wingspan of 25 feet (7.6 meters) and height of 8 feet (2.438 meters). (A second set of wings with a span of 31 feet, 9 inches (9.677 meters) was used on Hughes’ transcontinental flight, 19 January 1937). The H-1 has an empty weight of 3,565 pounds (1,617 kilograms) and gross weight of 5,492 pounds (2,491 kilograms). The data cited by Popular Mechanics seems to match the characteristics of P&W’s Twin Wasp Jr. S3A5-G aircraft engine. 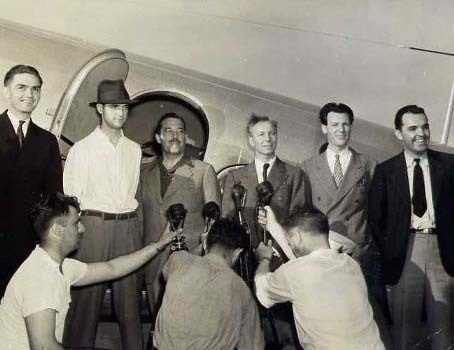 10–14 July 1938: Howard Robard Hughes, Jr., along with a crew of four, departed Floyd Bennett Field, Brooklyn, New York, on a flight to circle the Northern Hemisphere. His airplane was a Lockheed Super Electra Special, Model 14-N2, registered NX18973. Aboard were Harry P. McLean Connor, co-pilot and navigator; 1st Lieutenant Thomas L. Thurlow, United States Army Air Corps, navigator; Richard R. Stoddart, a field engineer for the National Broadcasting Company (NBC), radio operator; Edward Lund, flight engineer. Lieutenant Thurlow was the Air Corps’ expert on aerial navigation. Stoddart was an expert in radio engineering. Thurlow, Stoddart and Lund were also rated pilots. 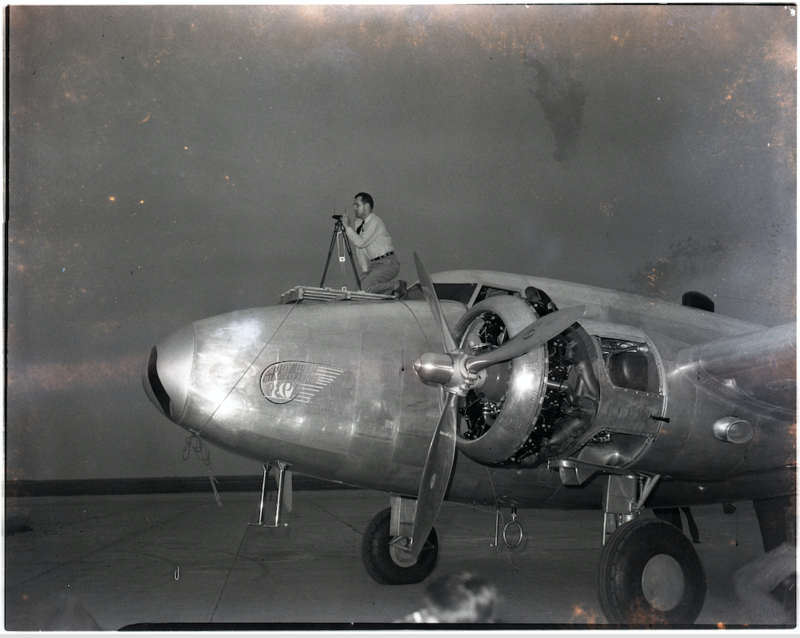 Before they took off from Floyd Bennett Field, the Lockheed was christened New York World’s Fair 1939, in keeping with an agreement that Hughes had made with Grover Whalen and the fair’s organizers. 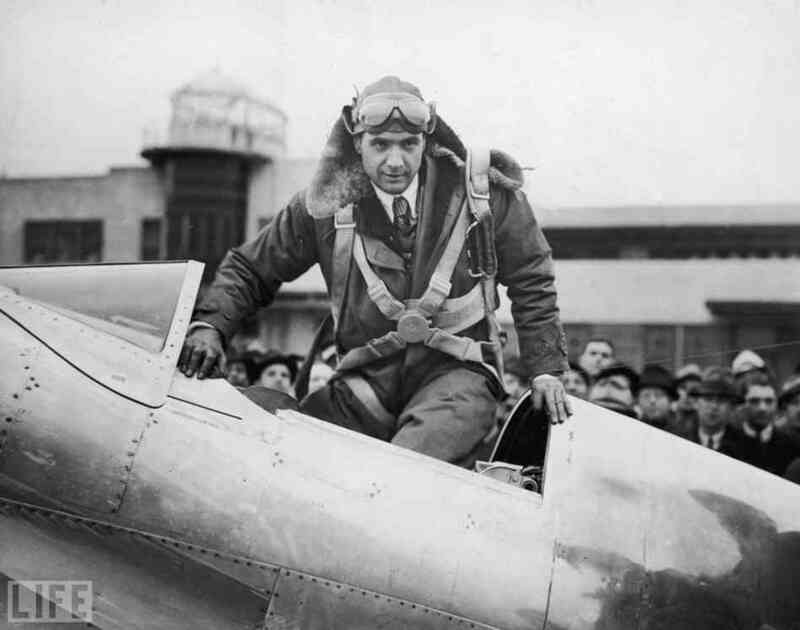 Howard Hughes and his crew departed Floyd Bennett Field at 7:19:10 p.m. on 10 July. The route of the flight was from Floyd Bennett Field to Le Bourget Aerodrome, Paris, France, a distance of 3,641 miles (5,860 kilometers), flown in an elapsed time of 16 hours, 38 minutes; Moscow, Russia, USSR, 1,640 miles (2,639 kilometers), 7:51; Omsk, Siberia, 1,400 miles (2,253 kilometers), 7:27; Yakutsk, Yakut ASSR, 2,158 miles (3,473 kilometers), 10:31; Fairbanks, Alaska, 2,457 miles (3,954 kilometers), 12:17; Minneapolis, Minnesota, 2,441 miles (3,928 kilometers), 12:02; and back to Floyd Bennett Field, 1,054 miles (1,696 kilometers) 4:26. They arrived at Floyd Bennett Field at 2:34 p.m., 14 July. The distance flown was approximately 14,800 miles (23,818 kilometers) (sources differ). The total duration was 91 hours, 14 minutes, 10 seconds. The actual flight time was 71 hours, 11 minutes, 10 seconds. Average speed for the flight was 206.1 miles per hour (331.7 kilometers per hour). The Lockheed Super Electra 14-N2, serial number 1419, was offered to Hughes by the Lockheed Aircraft Company, Burbank, California, at no cost. Company officials believed that publicity generated by an around-the-world flight would justify the expense. 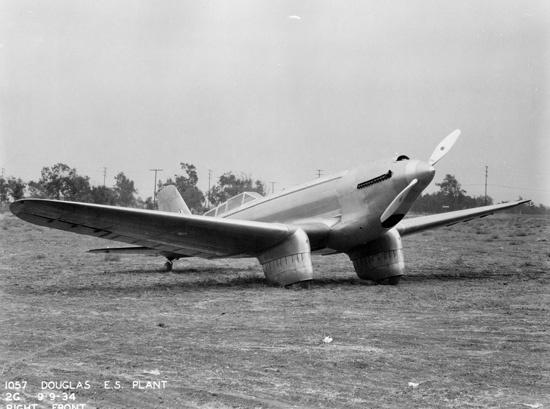 The airplane underwent modification for two months at the Burbank factory. 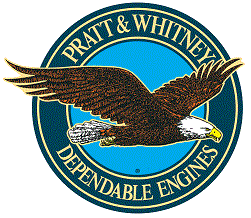 The Curtiss-Wright Corporation provided new engines. Fuel capacity was increased to 1,844 gallons (6,980.3 liters). Three radio systems were installed. 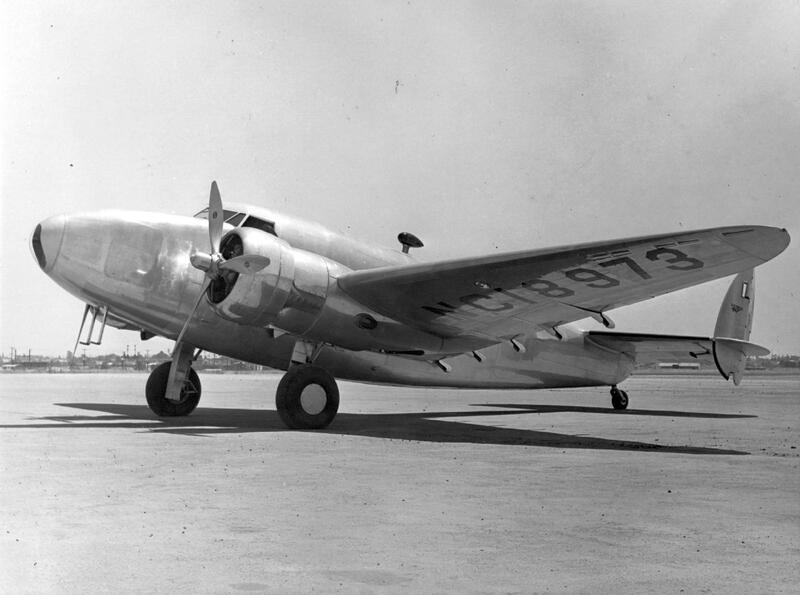 The Lockheed Model 14 Super Electra was an all-metal, twin-engine, low-wing monoplane with retractable landing gear, designed as a medium-sized airliner. It was flown by two pilots and could carry up to 12 passengers. 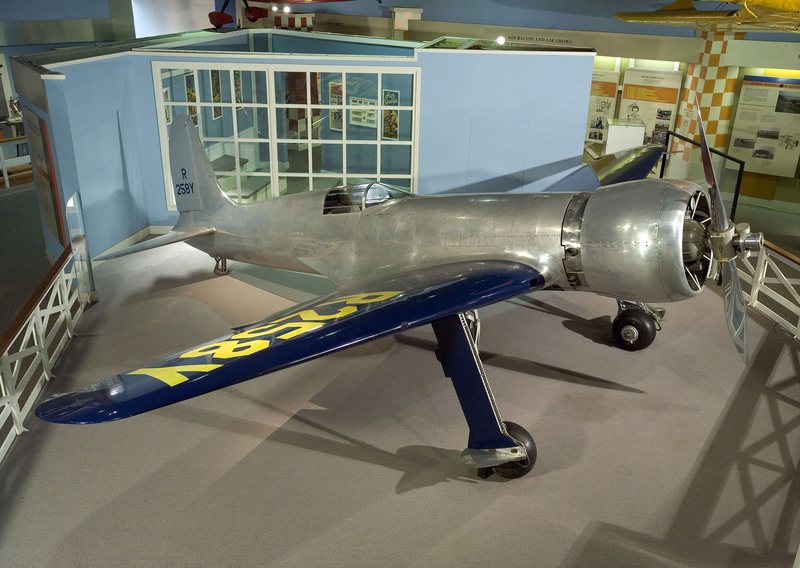 Based on aerodynamic studies carried out by Clarence L. “Kelly” Johnson on the earlier Model 10 Electra, the airplane was configured with an “H-tail”, with vertical fins and rudders placed at the ends of the horizontal stabilizer. 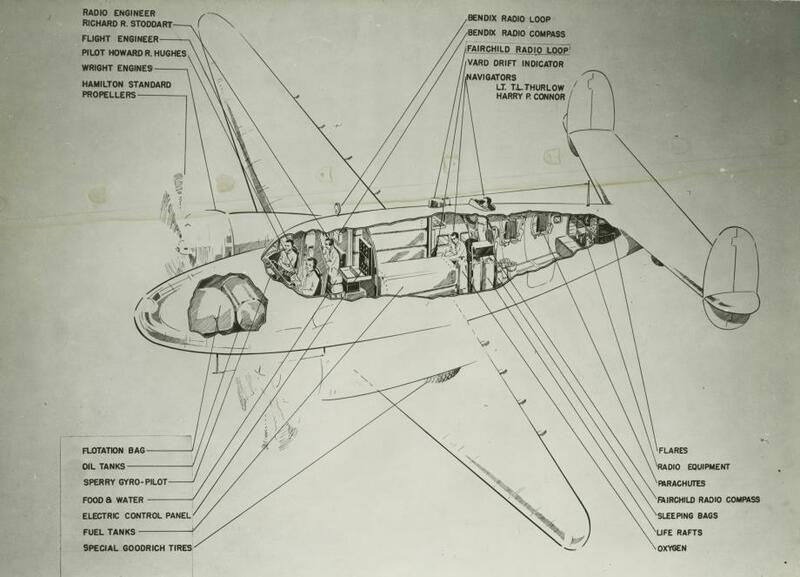 This was a characteristic design feature for Lockheed aircraft through the 1950s. 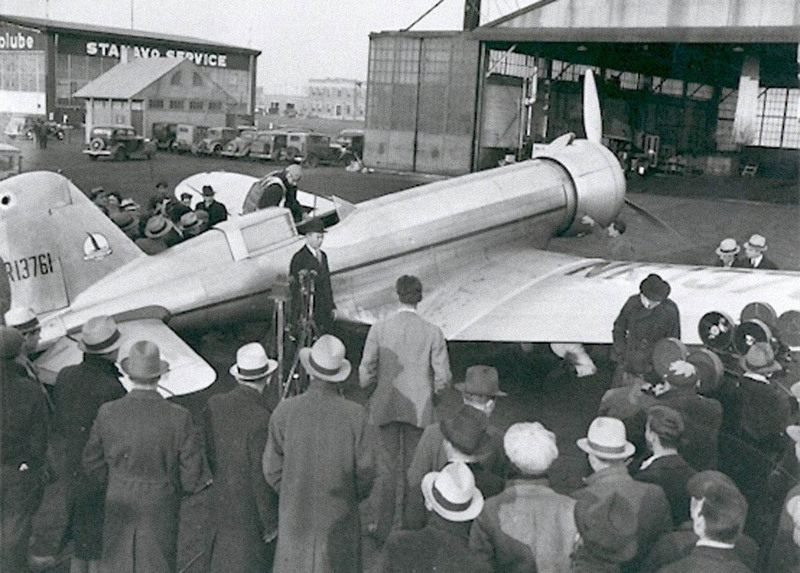 The Model 14 was 44 feet, 4 inches (13.513 meters) long with a wingspan of 65 feet, 6 inches (19.964 meters) and overall height of 11 feet, 5 inches (3.480 meters). 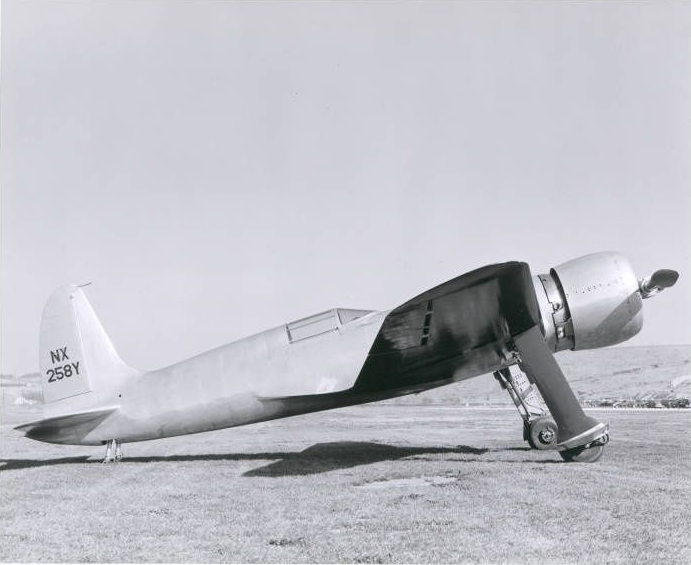 Hughes’ Model 14-N2 Special differed, but a Model 14-WF-62 airliner version had an empty weight of 10,750 pounds (4,876 kilograms), gross weight of 15,650 pounds (7,098 kilograms) and maximum takeoff weight of 17,500 pounds (7,938 kilograms). The airliner had maximum speed of 250 miles per hour (402 kilometers per hour) and a service ceiling of 24,500 feet (7,468 meters). NX18973 was powered by two air-cooled, supercharged, 1,823.129-cubic-inch-displacement (29.875 liter) Wright Aeronautical Division Cyclone GR-1820-G102 nine-cylinder radial engines with a normal power rating of 900 horsepower at 2,200 r.p.m., and 1,100 horsepower at 2,200 r.p.m for take-off. The engines had a compression ratio of 6.7:1 and required 91-octane gasoline. They turned three-bladed Hamilton Standard constant-speed propellers through a 0.6875:1 gear reduction. The GR-1820-102 was 4 feet, 0.12 inches (1.222 meters) long, 4 feet, 7.10 inches (1.400 meters) in diameter, and weighed 1,275 pounds (578 kilograms). Representative performance figures are maximum speed of 250 miles per hour (402 kilometers per hour) and a service ceiling of 24,500 feet (7,468 meters). NX19783 had an estimated maximum range of 4,500 miles (7,242 kilometers). On 10 November 1940, the Super Electra took off from Nairobi, Kenya, on a transcontinental ferry flight to from South Africa to Egypt. There were high winds and it was raining. After climbing to 500 feet (152 meters) AGL, the Lockheed banked to the left. It stalled, entered a spin and crashed. The wreck caught fire. All persons on board were killed.